I love night photography. There's something magical in the the solitary experience of the photographer as he tries to trap starlight in the camera and stamp it onto the frame. From my first star photo almost six years ago to the random nights driving around looking for dark spots in the dead of winter, the thrill I get from photographing the world at night has never dimmed. So, during my most recent trip back to California, under the brilliant Lake County stars, I got that old familiar feeling and found myself shaking off sleep and heading out into the night with my camera at midnight. Almost on a whim, I drove past my usual spots in the hayfields and headed for the Meadow Barn. You might remember that three years ago I set out to shoot night photos of all four barns original to my family's ranch. That project got a little sidetracked when I moved away to Hawaii, but the Meadow Barn (the third of the four barns) was always next on my list. The Meadow Barn is probably the most primitive of the four original barns. It has never had electricity, and was built mainly to store the winter hay for the cattle. It sits at the center of a long valley surrounded by low rambling hills and the big open sky. No electricity means no lights, and no lights means no way to illuminate the barn in the middle of that big darkness. The stars, numerous as they were, were not bright enough to throw light on the barn and without the added light of the moon the barn structure in my first few shots ended up as just a dark outline on the horizon. 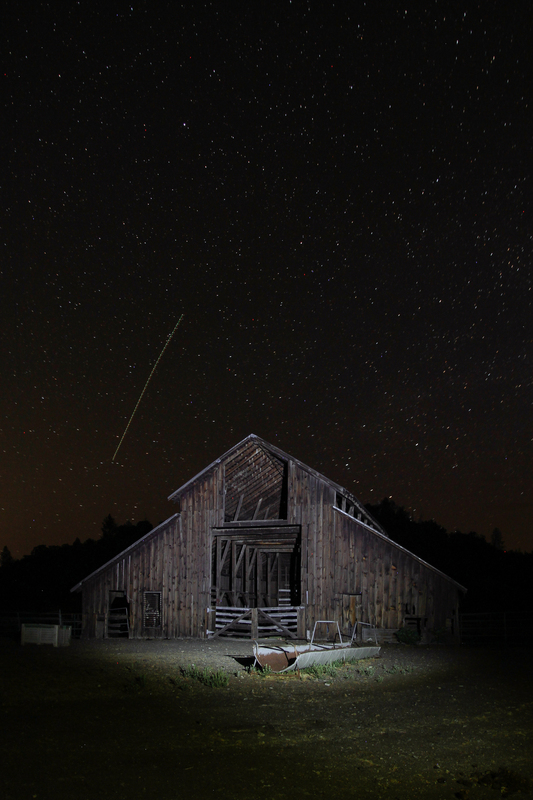 To overcome that, I flashed the face of the barn with a spotlight. Just for one or two seconds. This worked, but it also gave the barn a kind of blue tint that I didn't care for. That, combined with the fact that I had to ramp up the ISO which made the photos a little grainy, made we want to regroup and try again properly another night. Eventually, I'm hoping to haul out a generator and rig up a string of lights inside the barn, take a few really long exposures (my longest of these was ten minutes), and play with different angles. But on the night I shot these photos I didn't have the time or the help for that kind of work. Instead, I tried to test out different perspectives and exposure times and get a feel for how I might shoot the barn in the future. Overall I was pleased with how the photos turned out. I'm looking forward to getting back and having a second try--set up for a few hours, take my time, maybe shoot with a couple of cameras. But mostly I'm looking forward to getting back under the stars, opening up the shutter, and seeing what appears out of the darkness. That's the true magic of night photography.